Ugh. After all of that, it feels like you’re already hours into the project, and it hasn’t even started. All of this administrative stuff is really making it hard to focus on what you’re really good at – providing valuable content, services and products to your best customers. But as a tiny business owner, you might not be able to afford to hire someone to help you. It’s simple. You need systems. Business systems might be online tools or technology easier. Or, the system might be the process itself (be honest: have you EVER written any of your processes down on paper?). Perhaps it’s a service like IFTTT, which helps you automate repetitive tasks in your business so you no longer have to think about them. But What Systems Do You Need? Chances are, if there’s something about your operations that’s nagging at you, there’s a system that will relieve the pain. So your first step in systems planning is to identify business tasks that take too long, frustrate you, and don’t deliver the same result every time. Let’s use the client intake story above as a little case study. Instead of emailing a contract, waiting for the customer to sign it, figure out how to scan it, and email it back, you can use a service like OurDeal to get all your contracts signed digitally, in minutes. Create a link within your invoices that customers can click to enter payment information online (a service like SamCart or GumRoad might work for this). Doing this will significantly reduce the time between a client’s “YES!” and the actual project launch, while removing barriers to you receiving money (never a bad thing), and freeing you up to make sure that customer has an amazing experience with your business. And that’s going to feel really good. But I Don’t Have Time to Create Systems! Really? And yet you have time to waste on tedious tasks that take your time away from your customers and have the potential to damage their experience? I get it, though – creating business processes, systems and automation is a really huge task. But it’s a task that gets a lot easier with a little planning. It’s okay to start with the processes you need most urgently, but being reactive will only become overwhelming in and of itself. Think about where you see your business in 3-5 years. What systems are in place to keep it running smoothly? What is the ideal process for acquiring new customers, converting them, managing inventory, maintaining your blog? Visualize your business as a well-oiled machine and start planning the implementation of the systems that your company will eventually grow into. By creating systems one at a time, you’ll avoid the overwhelming feeling of trying to do it all at once, and over time you’ll start to feel a huge burden leave your shoulders as your time is freed up to do more of the things you love about your business. And your customers? They’ll notice. Who knows, you might have room for more of them, too! What’s one task in your business that you want to automate? Lay your frustrations out in the comments below, and let’s see if we can find a solution. When Jessica isn't busy helping her clients start and grow businesses that earn them a 6-figure income, she's road-tripping in the USA with her hubby and pooch, or developing her appreciation for a good West Coast IPA. She’s written the Ultimate Guide to Leaving Your Job and Planning a Business you Can Bank on, which you can download at http://www.renegadeplanner.com/broke-to-6-figures/ . Well explained article thanks for sharing, i like it. Really inspiring and worth for overcome small business woes. Thank you again, Have a Nice Day Ahead ! Well system beneficiaries for small business, its reduce cost and time. Jessica Oman thanks for sharing great post. 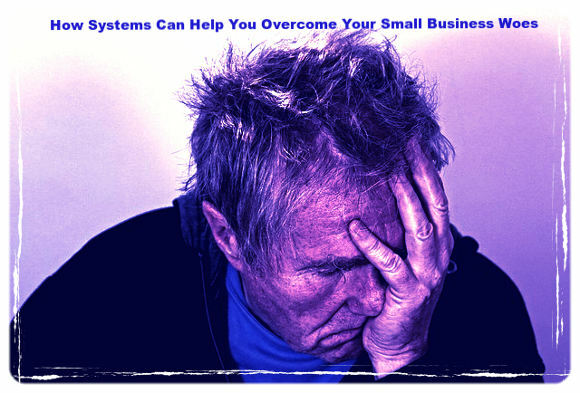 I guess this blog on How Systems Can Help You Overcome Your Small Business Woes would be really helpful and inspiring too. Great share!